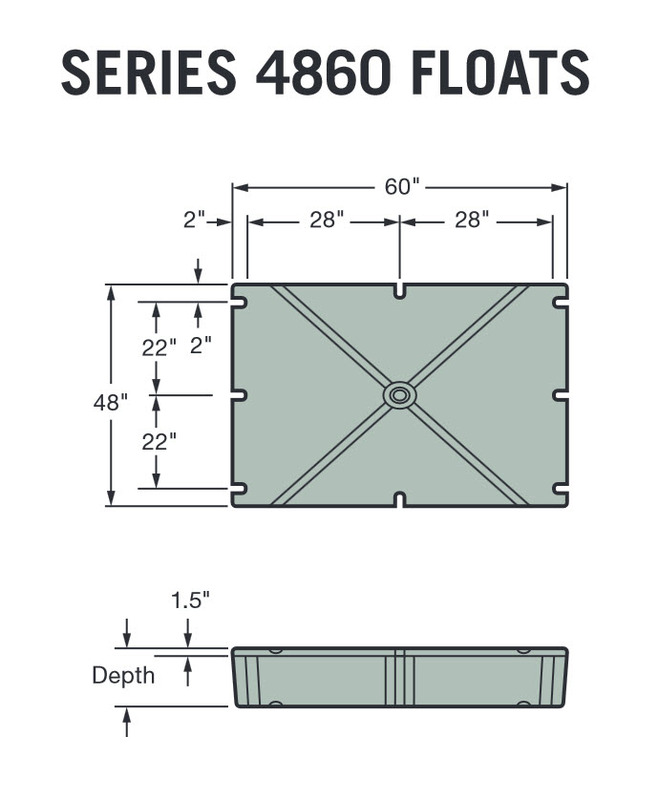 Dock builders and marinas now have easy access to high-quality, commercial grade Dock Floats. 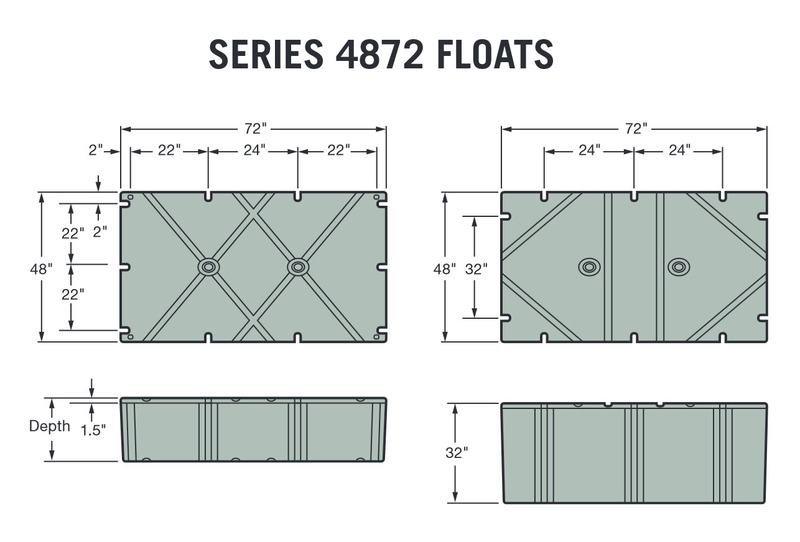 Our Dock Floats are available in 40 different sizes to match any application or marine construction projects you may be planning. 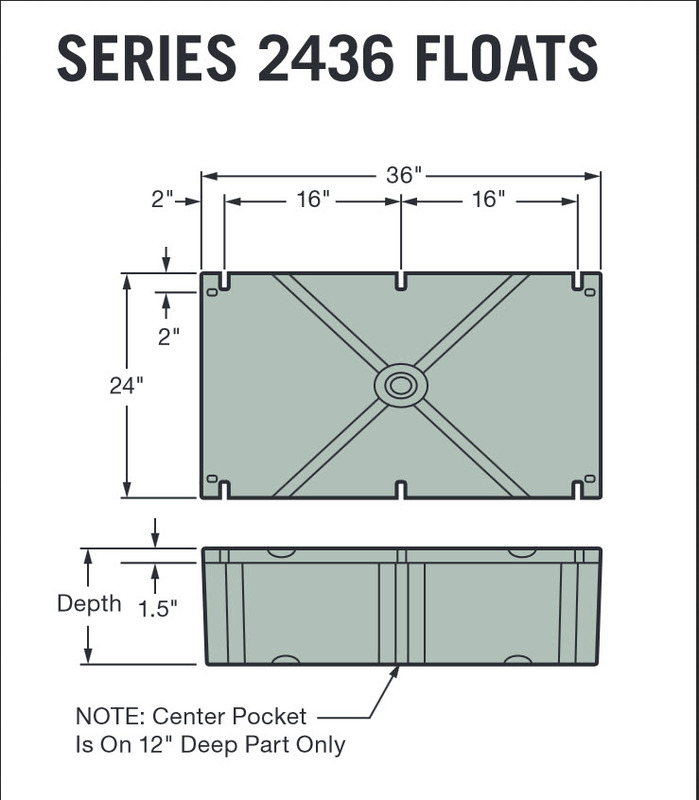 As the Ultimate Source for building and supplying a marina, Dock Boxes Unlimited offers reliable, high quality products like our selection of long-lasting Dock Floats. And you can depend on us for flexible shipping options too! 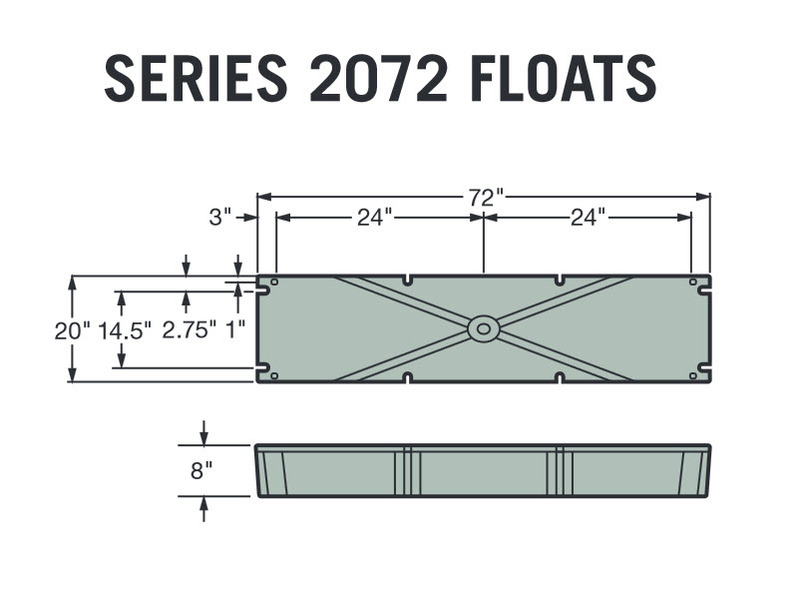 Our boat dock floats are suitable for outdoor use with respect to exposure to ultra-violet light, water exposure, immersion and fire in accordance with the Underwriters Laboratory class 746C and flame class UL-94HB. The dock float encasement also meet the Hunt Absorption Test and Falling Dart puncture and thickness test. 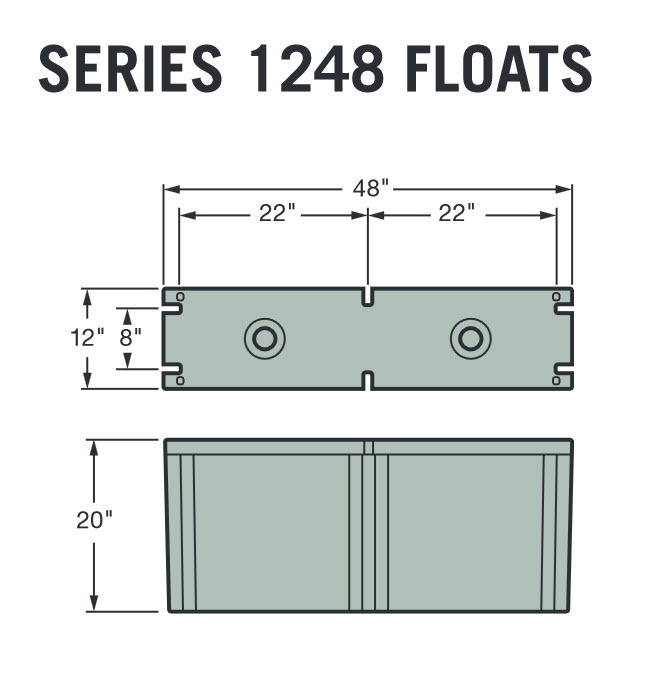 W: 24" D: 36" H: 16"
W: 24" D: 36" H: 12"
All Dock Floats are rotationally molded for seamless, one piece construction. 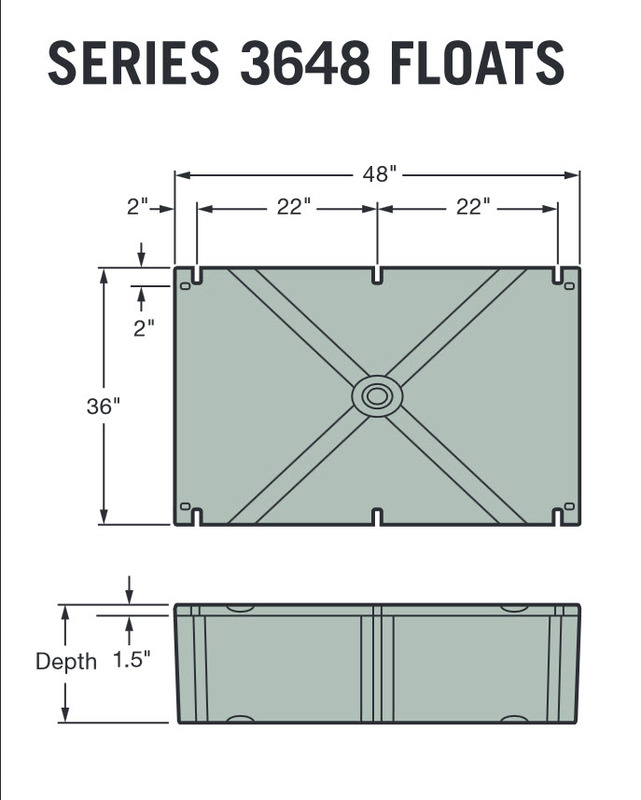 A Dock Float nominal wall thickness of .150 is standard on all encasements unless a specific wall thickness is requested. 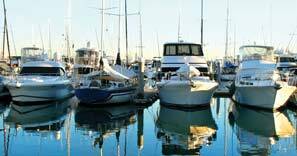 Dock Floats are resistant to damage by animals, ice, bumps to watercraft and contact deterioration from petroleum products. W: 24" D: 48" H: 24"
W: 24" D: 48" H: 20"
W: 24" D: 48" H: 16"
W: 24" D: 48" H: 12"
W: 36" D: 48" H: 24"
W: 36" D: 48" H: 20"
W: 36" D: 48" H: 16"
W: 36" D: 48" H: 12"
W: 36" D: 48" H: 8"
W: 36" D: 72" H: 24"
W: 36" D: 72" H: 20"
W: 36" D: 72" H: 16"
W: 36" D: 72" H: 12"
W: 48" D: 48" H: 24"
W: 48" D: 48" H: 20"
W: 48" D: 48" H: 16"
W: 48" D: 48" H: 12"
W: 48" D: 60" H: 24"
W: 48" D: 60" H: 20"
W: 48" D: 60" H: 16"
W: 48" D: 60" H: 12"
W: 48" D: 72" H: 32"
W: 48" D: 72" H: 24"
W: 48" D: 72" H: 20"
W: 48" D: 72" H: 16"
W: 48" D: 72" H: 12"
W: 48" D: 96" H: 32"
W: 48" D: 96" H: 24"
W: 48" D: 96" H: 20"
W: 48" D: 96" H: 16"
W: 48" D: 96" H: 12"
W: 36" D: 96" H: 24"
W: 36" D: 96" H: 20"
W: 36" D: 96" H: 16"
W: 20" D: 72" H: 8"
W: 12" D: 48" H: 20"
As the Ultimate Source for building and supplying a marina, Dock Boxes Unlimited offers reliable, high quality products like our selection of long-lasting Dock Floats. And you can depend on us for flexible shipping options too! 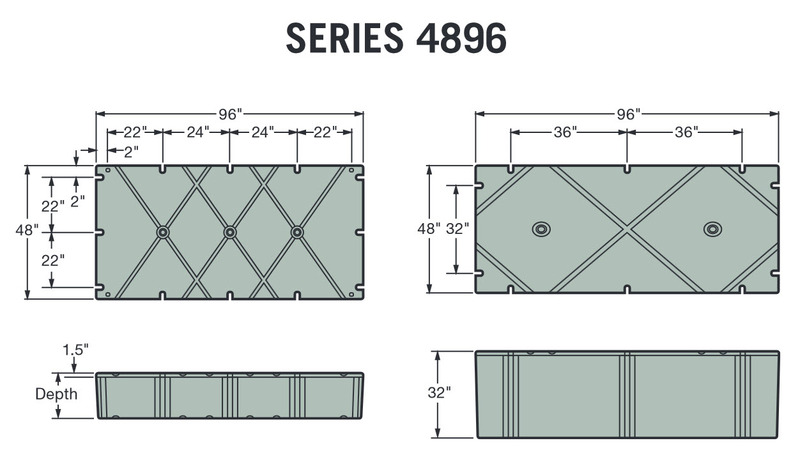 All Dock Floats are manufactured from linear virgin polyethylene resin containing UV ray inhibitors and carbon black pigment to protect against ultra-violet deterioration. These resins offer a balance of toughness, rigidity, environmental stress crack resistance and low temperature impact performance. Resin is also in compliance with the FDA title 21. 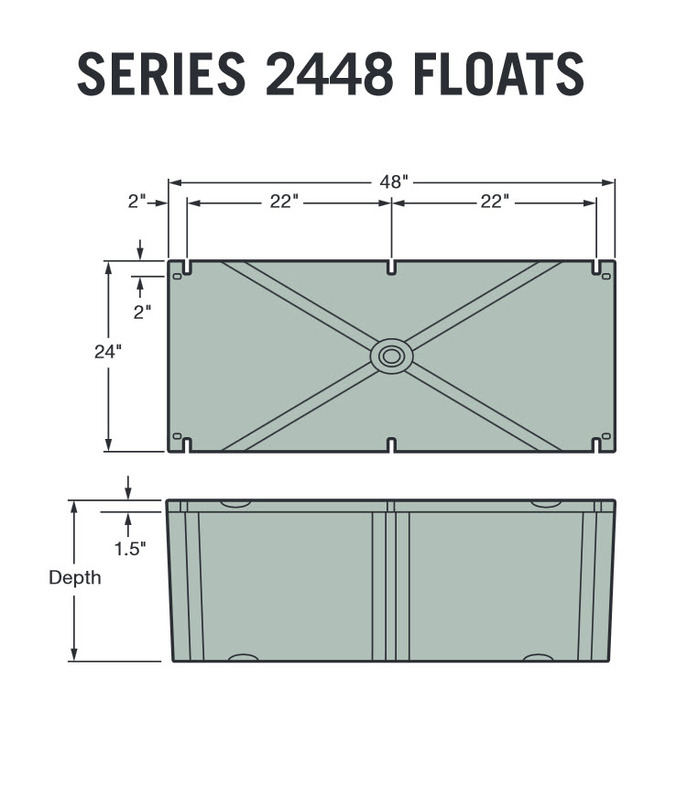 Dock Floats are constructed from a food grade material that will not contaminate the waterways and is recyclable. 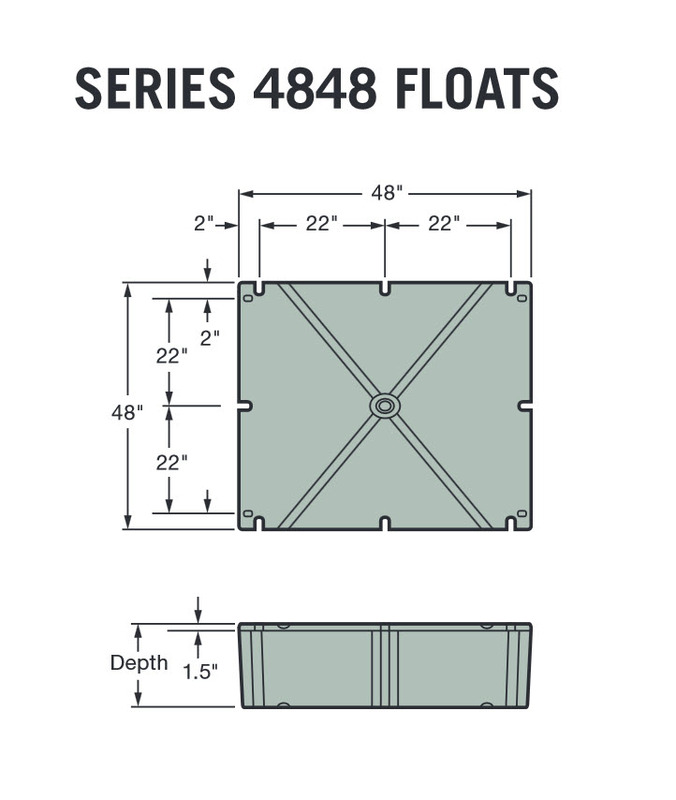 Available in standard and large configurations providing float drum buoyancy ratings from 450 to 4754. 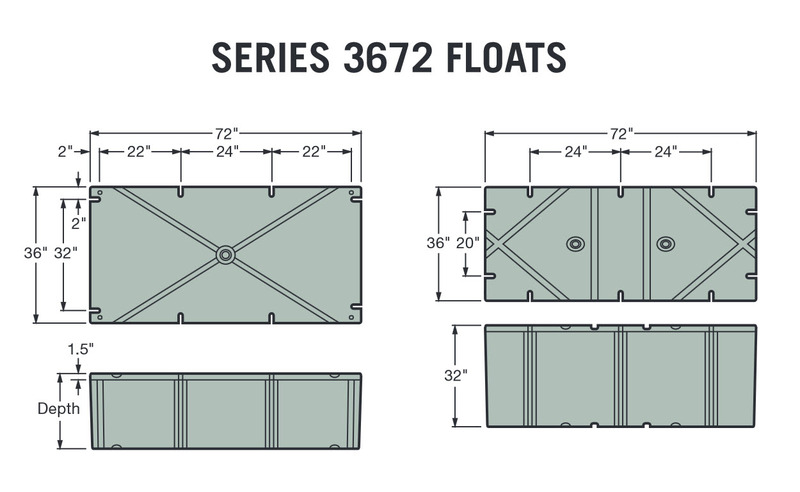 Our floats are suitable for outdoor use with respect to exposure to ultra-violet light, water exposure, immersion and fire in accordance with the Underwriters Laboratory class 746C and flame class UL-94HB. The encasements also meet the Hunt Falling Dart puncture and thickness test. 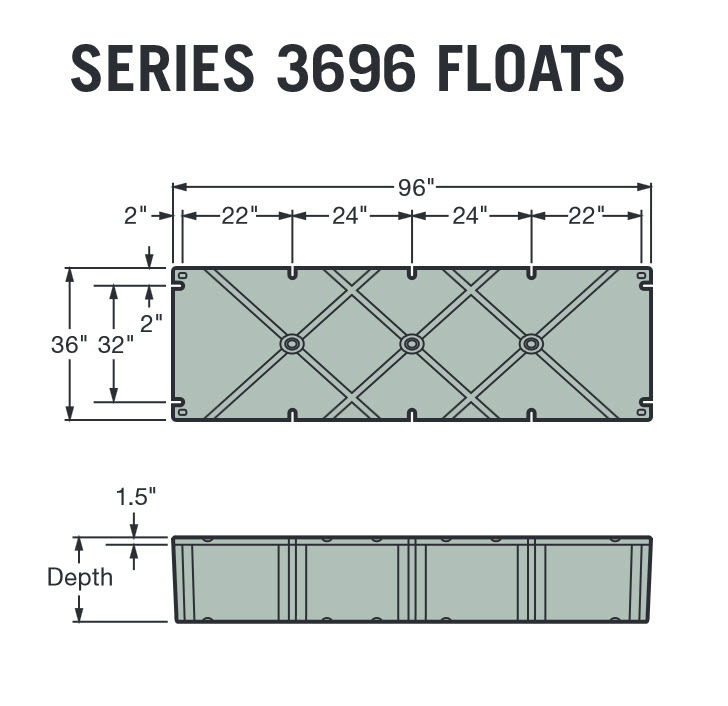 DBU also provide features and benefits that continue to set our products apart from other dock float industry products; and you can be assured the strictest specifications have been met with each and every float that we offer.